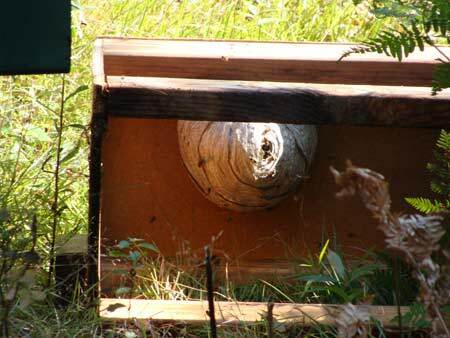 Do hornet's nests predict winter severity ? This box is only about 16" tall so the entrance to the nest was 7-8 inches off the ground. Re: Do hornet's nests predict winter severity ? Nice to here them tales, but I never gave them much thought. I'm sure there will be lots of snow, and early. I hope not , I saw one today that is at the end of a colvert in the ditch , so that would make it below grade ... Not much snow there . I guess that makes it a real "Honey Pot". What do you do with honey made inside of a septic tank in Canada? Sold as " Export grade "
Now that's funny no matter where ya live. Big nest/lots of bees= cold winter...seems bees suround the queen and keep her warm. The colder the winter the more bees needed. In the 50+ years since pop first told me this I have watched the bees every spring and they have yet to be wrong in their predictions. As far as bumble bees are concerned only the queen overwinters and is pregnant. She lays her eggs to produce workers in the spring to help with the next generation. If she dies in mid winter, that's the end of her line. You can find hornets nests to meet all those criteria in any given year. Don't know about hornets, but do you have onions? Checked our onions, skins plenty tough. When I was on my last saw-job, I spotted a paper nest, just off the woods roadway that was lower than the windows on my truck. Yesterday I started another job and spotted a paper nest on a phone pole, right where the fiber optic cable connects to the hardware. So around here it's hard to tell what the snow fall will be. I found another paper nest while picking some elderberies. This one is just below knee height, one of the inhabitants came around and stung me on an ankle , they where predicting that I was not going to be picking dem dere elderberries this year . That's what happened the last time I picked chokecherries. I never picked any since. Always hitting yellow jacket nests picking those darn things. I got in a nest of'm Monday cutting brush, and true to their habit they were in rotten wood in the ground and were not very happy with my feet in their nest. winter will only last for forty days. Buy a parka without delay! Page created in 0.801 seconds with 39 queries.